Toddler - $14.99 Only 9 left! Do you think that your child is going to grow up to be frightening? Frighteningly cute? Yeah, we thought so! 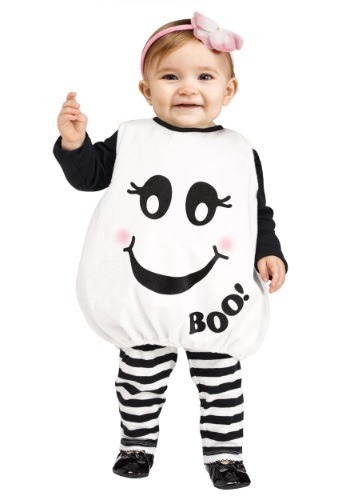 Forget about having your tot go in anything else this Halloween when you get them this adorable Baby Boo! ghost costume. Featuring a smiling ghost face, your little one is sure to give out smiles to everyone they meet when they go as this teeny weeny ghost! You're going to love getting your baby ready for their first Halloween when you get them this cute and easy-to-wear costume. A simple printed tunic means that your little one will be comfortable and you won't have to go through the hassle of dressing them up in an elaborate look. The Velcro closure and elastic fit means it will stay in place, and your child will be looking spooktacular. Just pull the tunic over their regular clothes, or pick out some coordinating leggings and a long-sleeve to complete the look. Get your little one ready to say "boo" and everyone's going to enjoy being haunted by your toddler!